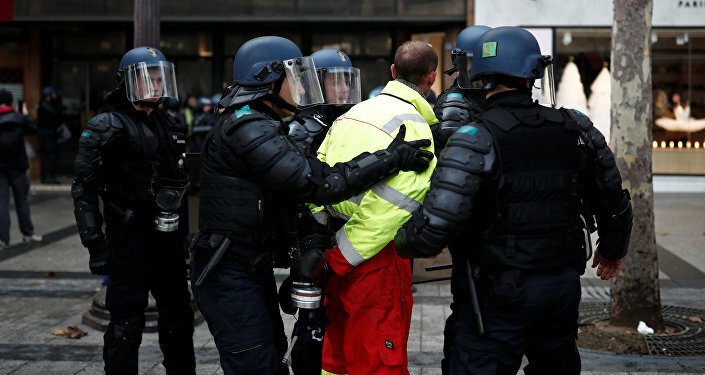 MOSCOW (Sputnik) - French law enforcement bodies have detained 950 people in Paris during the ongoing yellow vests protests against rising fuel prices, the Agence France-Presse said Saturday citing its police sources. The data comes shortly after the statement of Deputy Interior Minister Laurent Nunez who told France 2 broadcaster that 700 people had been detained. Earlier in the day, French Prime Minister Edouard Philippe said that 481 people had been detained, of whom 211 people had been placed under arrest. Prior to the official's announcement, the BFMTV reported that 354 people had been detained, and 127 of them had been placed under arrest. Earlier in the week, the French government stated that it was abandoning the planned tax hike, which triggered demonstrations. However, it has not resulted in protests cancellation. The "yellow vests" protests, named after the obligatory attribute of French drivers, a yellow light-reflective vest, have been held in France since November 17. Last Saturday, over 100,000 people took part in demonstrations in Paris, with mass actions on the Champs Elysees having resulted in violent unrest. In late 2017, the French government approved the decision to raise direct tax on diesel fuel, the most popular type in the country. The diesel prices in France have risen by around 23 percent since the beginning of the year, while the gasoline prices have gone up by 15 percent. Prices are set to increase further in January.